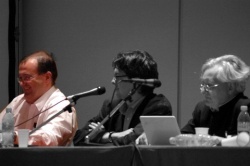 Rotan at various W3C-related events over the years. The original photos are elsewhere on the Web. 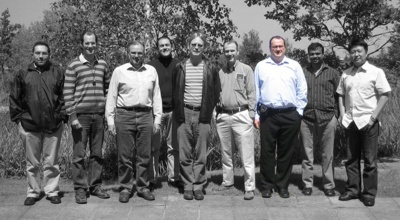 The "TP"s started in 2001 as a gathering of all the W3C working groups. It was a massive cross-pollination of ideas but it wasn't until 2004 that some of the workings of the TP started to appear in the public record. This picture is the first to be published as part of an official TP record, and I am to be found on the left. The doors you can see just above my head lead to the corridor where coffee is served, and where much of the real work takes place! 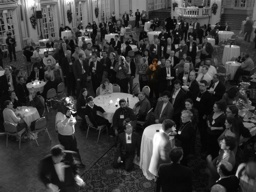 The W3C celebrated its 10th birthday in style at the Fairmont Copley Plaza in Boston. The speakers were many, and all were well known names. It was great to hear Tim Berners-Lee and Bob Metcalfe having a chat on an couch on stage. Massachusetts even declared December 2004 to be W3C Month! 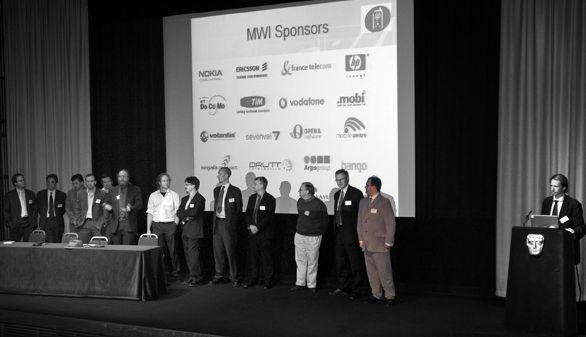 The MWI sponsors gathered in London in 2005 for a major press event. Tim Berners-Lee gave the opening address by video link and there were several presentations and panel sessions afterwards, one of which I chaired. The event took place at the BAFTA (British Academy of Film & Television Arts) in London, my only time to be in the place where the prestigious awards are presented. In 2006 the Device Description Working Group (DDWG) held an open workshop at the Telefónica I+D facilities in Madrid. As chair of the DDWG, I also chaired the workshop. It was attended by many of the major players in the DD space and produced many good ideas that eventually found their way into a new Web standard (which took two more years to complete). Another year, another workshop. This time I arranged support from Enterprise Ireland to host an open international workshop and a follow-on face-to-face meeting of the host working group, the Ubiquitous Web Application (UWA) WG. The workshop was held in the Alexandra hotel in central Dublin. As the report says, I delivered a presentation without slides, pleading with the attendees to make markup invisible, in keeping with the theme of the workshop, which was promoting declarative approaches to creating Web content and applications. I opened by saying "I hate markup," which provoked an interesting response! The face-to-face took place after the workshop. The photo was taken near my place of work in Dublin. It was early June and the weather was great. 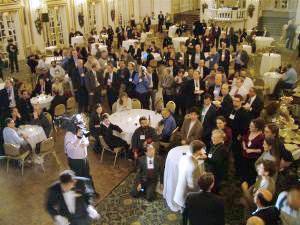 At one time I was part of the 2007 Program Committee, which also combined with the meeting of the W3C Advisory Committee (in which I had been a member for over 6 years, and still counting). TP+AC=TPAC. That was quite an interesting experience, but in 2008 I found myself on the stage moderating several of the TPAC Plenary sessions. I organised over a dozen lightning sessions, and one major session on the W3C Recommendation process. I was with many experienced colleagues, such as the two seen beside me in the second photo (Dan Appelquist, chair of BPWG, and Steven Pemberton, chair of HTML WG). That was a looong day! 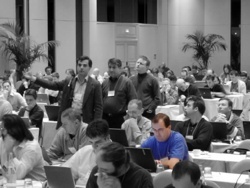 Like the 2004 event, the first picture on the official minutes page has a picture of just me, facing away from the camera and what you get is an unfortunate view of my thinning hair! A virtual presence this time. Ian Jacobs, the head of W3C Communications, asked if I would agree to be interviewed as part of a series of interviews the W3C was conducting. Naturally I agreed. Questions were posed, answers were given and the whole lot is now on the W3C's Q&A Blog. Other recent interviewees include two of my regular colleagues in the mobile Web standards world, Dan Appelquist (Vodafone) and Chaals McCathieNevile (Opera). Many of the other events that I've attended over the years do not maintain persistent and public records. which is probably just as well as I'm sure I'm wearing some silly T-shirt or something equally embarrasing.